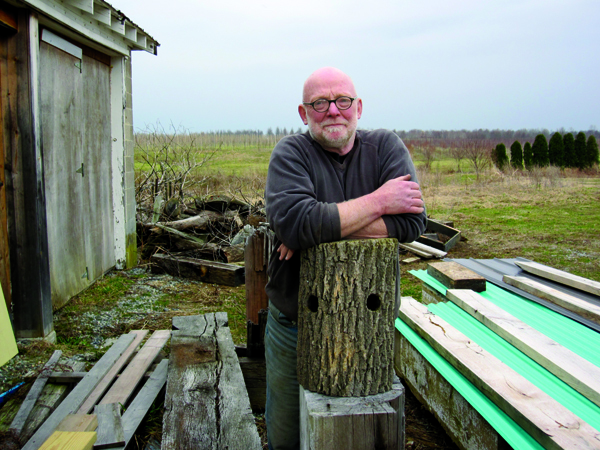 Working with salvaged materials is still new for Larimore—as are his surroundings. After 30 years as a furniture designer in Philadelphia, he recently moved his studio here, to Cumberland County, NJ, about an hour from the hubbub of the city (though his current neighborhood, Mt. Airy, moves at more of a shuffle). Finding this area was something of a happy accident—a few years ago he attended a nearby barbecue with his wife. They fell in love with the agricultural landscape and the smell of the nearby salt marshes, and eventually purchased this 10-acre farm. Larimore now spends about four days a week out here, working in the garage-turned-studio adjacent to a field filled with miniature horses (they rent the space to a neighbor who raises them). The couple hopes to find someone to do a bit of organic farming on the land as well. This was the mid-’70s, and the house happened to be around the corner from Richard Kagan’s furniture studio and gallery. Larimore started experimenting with the craft, and soon he was hooked. As his career developed, Larimore worked mostly by commission—tackling elaborate, intensive projects that involved heavy collaboration between the artist and the buyer. But recently, he’s gone in a slightly different direction, focusing more on sustainability and accessibility. Larimore’s material of choice for his new line is large, salvaged timbers. Most of them are acquired through Provenance Architectural Salvage (profiled in Grid’s recent House & Home issue).